I have sold a property at 1306 821 CAMBIE ST in Vancouver. RAFFLES on ROBSON! In the centre of it all. This is a spacious two bedroom two bath unit with great separation of rooms for guests or sharing. There is a large open kitchen with top of the line stainless steel appliances. Perfect for entertaining. Stone counters, rich floors and modern finishes. This is just the place you will want to call home. Lots of space to work from home in a bright corner office. Lots of Storage in the suite with an additional big flex room. Great building with a fourth floor rooftop deck, gym and swirlpool. Awesome location minutes walk from Yaletown, The Seawall, Library, entertainment, restaurants and shopping. It's a perfect match for your downtown lifestyle. YOU'LL LOVE IT! I have listed a new property at 104 2234 1ST AVE W in Vancouver. OCEAN VILLA. North of fourth. The Beach, Kits Pool, shopping, restaurants and where you want to be. This is a fully renovated two bedroom unit in a well run boutique building in the heart of the action. IN THE KITCHEN: Ceasar Stone Quartz countertops, Stainless Steel appliances, tile backsplash recessed LED lighting, Smoked Acacia German made HARO Laminate Flooring. IN THE BATH: Large format ceramic tile, floating vanity and modern light fixture. Totally and tastefulLy updated. Large master bedroom, your own private patio for morning coffee and afternoon relaxing. The building has a shared rooftop deck overlooking English Bay and the North Shore. YOU'LL LOVE IT! Please visit our Open House at 104 2234 1ST AVE W in Vancouver. Please visit our Open House at 1306 821 CAMBIE ST in Vancouver. I have sold a property at 7 5885 Yew ST in Vancouver. Amazing one suite per floor apartment in the Heart of Kerrisdale, Bing Thom designed building with Amazing views. I have listed a new property at 1306 821 CAMBIE ST in Vancouver. I have sold a property at 401 1967 BARCLAY ST in Vancouver. THE PALASADES. West of Denman, one block from Stanley Park and a short stroll to English Bay. Smart studio layout in a freehold concrete building on a Gorgeous tree-lined street. Re-piped 2004. New elevator 2009. New roof 2015. Full exterior painting caulking and sealing 2016. This unit has hardwood parquet floors, big windows and a large balcony. Original condition makes the perfect opportunity to customize and design your own personal nest in the heart of the West End. Free Laundry. Parking available by wait list though strata $30-40/month. Pets OK. Rentals limited to 5. YOU'LL LOVE IT! I have sold a property at 857 45TH AVE E in Vancouver. Super building lot or renovation project with a 33 acre backyard. This is a 61x66 foot, RS-1 zoned lot that backs right on to South Memorial Park. Very unique location to design and build your dream house or bring this charming three bedroom up, three level home, with generous rooms, back to it's original splendor. Gorgeous mature hedge for privacy. On the 45th AV bike route. Close to schools, shopping, and transportation. This is the opportunity you have been waiting for in the neighborhood you know. YOU’LL LOVE IT! VANCOUVER, BC – July 5, 2017 – The imbalance between supply and demand in the condominium market is creating home buyer competition across Metro Vancouver*. The Real Estate Board of Greater Vancouver (REBGV) reports that residential property sales in the region totalled 3,893 in June 2017, an 11.5 percent decrease from the 4,400 sales recorded in June 2016, an all-time record, and a decrease of 10.8 percent compared to May 2017 when 4,364 homes sold. Last month’s sales were 14.5 percent above the 10-year June sales average. “Two distinct markets have emerged this summer. The detached home market has seen demand ease back to more typical levels while competition for condominiums is creating multiple offer scenarios and putting upward pressure on prices for that property type,” Jill Oudil, REBGV president said. There were 5,721 detached, attached and apartment properties newly listed for sale on the Multiple Listing Service® (MLS®) in Metro Vancouver in June 2017. This represents a 2.6 percent decrease compared to the 5,875 homes listed in June 2016 and a 5.3 per cent decrease compared to May 2017 when 6,044 homes were listed. The total number of properties currently listed for sale on the MLS® system in Metro Vancouver is 8,515, a nine percent increase compared to June 2016 (7,812) and a 4.2 percent increase compared to May 2017 (8,168). 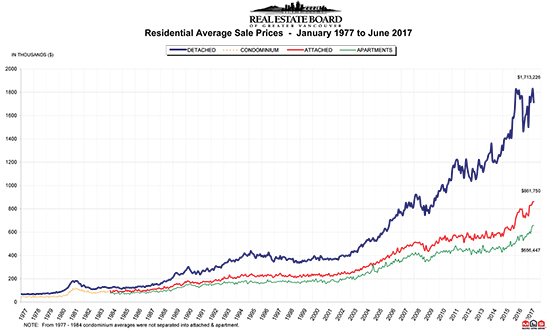 For all property types, the sales-to-active listings ratio for June 2017 is 45.7 percent. By property type, the ratio is 24.5 percent for detached homes, 62 percent for townhomes, and 93.2 percent for condominiums. The MLS® Home Price Index composite benchmark price for all residential properties in Metro Vancouver is currently $998,700. This represents a 7.9 percent increase over June 2016 and a 1.8 percent increase compared to May 2017. Sales of detached properties in June 2017 reached 1,320, a decrease of 15.5 percent from the 1,562 detached sales recorded in June 2016. The benchmark price for detached properties is $1,587,900. This represents a 1.4 percent increase from June 2016 and a 1.1 percent increase compared to May 2017. Sales of apartment properties reached 1,905 in June 2017, a decrease of 9.6 percent compared to the 2,108 sales in June 2016. The benchmark price of an apartment property is $600,700. This represents a 17.6 percent increase from June 2016 and a 2.9 percent increase compared to May 2017. Attached property sales in June 2017 totalled 668, a decrease of 8.5 percent compared to the 730 sales in June 2016. The benchmark price of an attached unit is $745,700. This represents a 10.7 percent increase from June 2016 and a 0.6 percent increase compared to May 2017. I have sold a property at 1928 VENABLES ST in Vancouver. 1968 Vancouver Special at an unbeatable location off the Drive with Amazing views of the North Shore Mnts. Located in the sweet pocket of Grandview, this well maintained, one owner house is move in ready & waiting for your updates. Just East of Victoria Dr. this block is traffic calmed & not a through fare, beautifully landscaped and 2 blks to schools and the Drive. Main floor has 3 bdrms, full bathrm, huge South facing deck right off the kitchen expansive North Shore Mnts views form Lv/Dn rm W wood fire place. Lower floor is connected W open floor plan, full kitchen living rm W gas fireplace, 4 piece bath & 1 bdrm, laundry, work shop & attached one car garage.